This article analyses how the post-1908 Ottoman Empire is represented in Türk Tarih Kurumu’s historiographical journal Belleten between 1937 and 1950. The post-1908 Ottoman Empire is a marginal topic in Belleten’s first years. When it is addressed at all, it mainly focuses on Mustafa Kemal’s biography and the Turkish War of Independence. While the Constitutional Revolution is positively evaluated, and the Young Turks are partly represented as ideological predecessors to the Kemalists, the authors also use the Second Constitutional Era as a dark contrast against which they can show the Republican reforms and successes more clearly. Aspects of the recent past that relate to the Ottoman state and government institutions are strongly historicized, while simultaneous events relating to Mustafa Kemal’s biography are discursively brought close to the present by using personal memory as a legitimate source. More than half of the authors writing about the recent past hold a political office, indicating an overlap between the political and the historiographical discourse. VI. Science and Progress – or Backwardness? 4In this vein, I will show that closer analysis of early Republican state historiography’s representation of the recent Ottoman past provides us with a vivid and varied picture. Studying the ways in which ruptures and continuities between the Empire and the Republic have been constructed can help us understand the early Republic’s regime of historicity, that is, “the way in which a society considers its past and deals with it” (Hartog 2005: 8), how this conception of the past is linked to imaginations of the present, and how the notions of memory and history relate to each other (Hartog 2015: 16). 5In order to study these questions, I chose Türk Tarih Kurumu (TTK)’s official journal Belleten as a case study. Belleten cannot – and should not – be taken as representative of all of resmî tarih, but it occupies a special place in the Kemalist historiographic discourse. Belleten laid claim to setting the tone for the overall historico-political debate in the consolidating Republic of Turkey – a claim it succeeded to meet to a remarkable degree. This renders the study of Belleten an important element within the larger research field of re-evaluating Republican historiography in the 1930s and 1940s. 6The present article provides an analysis of Belleten’s first 14 volumes (56 issues), published between 1937 and 1950. From within these volumes, I analyze the articles relating to the late Ottoman Empire, that is, the period beginning with the constitutional revolution in 1908 and ending with the demise of the last Ottoman Sultan in November 1922. Naturally, the time frame from 1908 to 1922 is not a monolithic block and should not be thought of as an internally cohesive ‘era’: It includes aspects and episodes as diverse as the direct aftermath of the constitutional revolution, the Young Turk cabinets, the attempt at counterrevolution in April 1909, the Libyan War, the Balkan Wars, the subsequent coup d’état of 1913, the First World War, the armistice era, the occupation of Istanbul and the Anatolian movement, with the post-war Istanbul government as its antagonist and nemesis. Still, in all its diversity, the period from 1908 to 1922 is the last stage of the Ottoman Empire, the revolution of 1908 being widely recognized as a sizeable historical turning point. I choose this period as an analytical category in this article, not because it represents a coherent entity, but because I am interested in analyzing how the authors in Belleten themselves come to terms with this disparate timespan, what episodes, events and actors they choose to highlight, and what implicit periodization we can deduce from their writings. The question is all the more relevant because the timeframe from 1908 to 1922 not only represents the Republic of Turkey’s immediate predecessor regime, but also a very recent past of which some, if not all, the authors have personal recollections. It will be shown that this specific timeframe is represented in Belleten in a highly ambivalent way: as a period that is integrated into a Republican genealogy, but also relegated to a distant past with a negative connotation. 7Defining 1950 as the end of this sample is a deliberate periodization, yet not arbitrary: The goal of the article is to give an impression of the consolidating state historiography in the late 1930s and 1940s. Rather than emphasizing the political power shift of 1950 and its putative impact on historiography, I argue with Gürpınar “that the building blocks of nationalist imagery had been erected by ” and that this year more or less accurately marks the “time when popular history and the scholarly study of history began to diverge” (Gürpınar 2013: vii). Belleten itself, together with journals such as Tarih Vesikaları and Ankara Üniversitesi Dil ve Tarih-Coğrafya Fakültesi Dergisi played an important role in the development of scholarly historiography. Belleten stands out as a particularly worthwhile case study because research and ideology, source criticism and “nationalist imagery” are not separated by “a clear line between popular historiography and academic historiography” (Gürpınar 2013: 17); they exist alongside each other in Belleten. Between 1937 and 1950, Republican historiography reached a more or less stable stance towards the Ottoman past, and could view it from a safe distance: Neither the Empire nor any dynastic opposition posed a political threat to the Turkish state any more (Danforth 2014: 656; Gürpınar 2015: 398). 8Belleten is a quarterly journal, founded in 1937, which has appeared without interruption ever since. It is issued by Türk Tarih Kurumu, Turkey’s main state-run historical research body. TTK was founded as one of Mustafa Kemal’s top-priority projects in 1931 under the name of Türk Tarihi Tetkik Cemiyeti and acquired its present name in 1935 (Foss 2014: 829–830; İğdemir 1973: 7). TTK was the most important means by which “the Kemalist state attempted to monopolize historical scholarship in the early 1930s and restructured the contours of the national historical imagination” (Gürpınar 2013: 19). It is the Republican successor organization of the Ottoman Târîh-i Osmânî Encümeni (TOE), which had been founded in 1910. However, TTK largely differed from its predecessor institution in its programmatic outlook: Instead of focusing on Ottoman history without integrating it into a larger framework of Turkish history (Kafadar and Karateke 2011: 570–571), TTK put a strong emphasis on the study of a Turkish continuity that spanned millennia by “dedicating itself essentially to prehistory and antiquity, and by conferring disproportionate importance to questions of origins” (Copeaux 1997: 51). 9Belleten was founded “to function as the Turkish equivalent of the European national historical reviews to embody and promote Turkish scholarship (within Kemalist and statist premises)” (Gürpınar 2013: 19). Due to its consistency in publication, Belleten was an important factor in the “gradual but unmistakable institutionalization” (Kafadar and Karateke 2011: 573) of Turkish historiography. 10Belleten can be seen as the main state organ for historical research and opinion making.2 It can also be distinguished from university journals such as the Ankara Üniversitesi Dil ve Tarih-Coğrafya Fakültesi Dergisi (published from 1943) or İstanbul Üniversitesi’s Türkiyat Mecmuası (published from 1925), which have been instrumental in spreading and standardizing scientific historical methodologies in their own right (Kafadar and Karateke 2011: 574): Belleten, through TTK’s claim to “write a national history for the Turkish nation whose sense of self and unity is awakening” (Türk Tarihi Heyeti 1930: 1) and its close ties to Ankara’s political elite and decision-making circles, is the representation of TTK’s plans and mission as they were continually put into practice. Still, Belleten was not the only historiographical journal published by a state-run institution: Tarih Vesikaları was published from 1941 by the Ministry of Education, under the direction of Minister Hasan-Âli Yücel. It was planned as a medium through which original sources from Turkish and Ottoman history could be published, edited and analyzed (Serin and Boztaş 2011: 351–352). Tarih Vesikaları and Belleten have a largely similar circle of authors, while Tarih Vesikaları, due to its focus on textual sources, emphasizes Ottoman history rather than anthropology or archaeology. In Tarih Vesikaları, the very recent past is mainly represented by Faik Reşit Unat’s contributions on the history of the Turkish War of Independence, with a strong focus on Mustafa Kemal’s political biography (Unat 1941a, 1941b, 1942a, 1942b, 1942c, 1942d, 1942e, 1943, 1944, 1949). However, Tarih Vesikaları saw continuous publication only until April 1943; afterwards, its publication became intermittent and grew ever sparser until finally several years lay between editions of the originally bi-monthly journal, which eventually stopped completely in 1961. I conclude that Tarih Vesikaları, although an interesting case study in itself, was not as high on the state’s agenda as Belleten with its flawless publication record. If we want to learn about the continuous implementation, development and practice of early Republican state historiography, Belleten provides a highly relevant case study. 11Although we find a wide range of Turkish and foreign3 historians publishing their thoughts within Belleten’s pages, I argue that from a discourse-theoretical point of view, it is legitimate to investigate it as a whole. What has been published in Belleten, at least until 1950, but presumably also later on, has passed the approval of the editors’ board and, thus, can be said to at least not flagrantly contradict official historiographical views. It is all, by its very definition, within the hegemonic field of sayability constructed by state-issued historiographical publications, which also include schoolbooks, proceedings of the Türk Tarih Kongreleri, publications such as Türk Tarihinin Ana Hatları (Türk Tarihi Heyeti 1930), but also programmatic speeches like Mustafa Kemal’s Nutuk from 1927 ([Atatürk] 1927). This field of sayability gains specific relevance from the fact that “with the consolidation of the Republican régime in the second half of the 1930s, most historians who wished to pursue an academic career in Turkey toed the official line. The others were marginalized […] and their studies only appeared in publications lacking official support” (Ersanlı 2002b: 116). I hence treat the articles within Belleten not as coming from one unified, abstract, and cohesive imagined person, but as elements of a distinct controlled discourse with effective entry barriers (Maasen 2009: 41). 5 H. Bayur, M. Göker, Ş. Günaltay, Â. İnan, Y. Z. Özer and İ. H. Uzunçarşılı. 6 H. Z. Koşay and O. Ş. Uludağ. 13The 33 articles examined here have been written by twenty authors, not counting those two whose books have been reviewed. One piece has appeared without mention of an author (Türkiye tarihinin son 20 yıllık devrine ait kronoloji (14.X.1918-30.I.1921), 1938). Six of the authors are, at least at some point, presented with the academic title “Prof.”,5 two carry the degree of “Dr.”.6 Two authors held public positions in the academic field: Cemil Bilsel as the rector of İstanbul Üniversitesi (1934-1943) and Aziz Ogan as the general manager of Istanbul’s archeological museums (1931-1952). Eleven authors had, at their time of writing, a relation to TTK that went beyond the mere fact of authorship in its journal: İnan Âfet as its vice president, Muzaffer Göker and Uluğ İğdemir as general secretaries, and Hasan-Âli Yücel as the president of the Second Turkish History Congress organized by TTK. Seven more were common TTK members: Hikmet Bayur, Şemseddin Günaltay (his article dates from 1938, before his TTK presidency), Aziz Ogan, F. Öymen, Yusuf Ziya Özer, İhsan Sungu and İsmail Hakkı Uzunçarşılı. 16Seventeen of the twenty authors are men. The two authors within the sample who are immediately identifiable as female are İnan, who, as the adopted daughter of Mustafa Kemal, assumes an exceptional position, both socially and academically, and the literary scholar Fevziye Abdullah Tansel. In F. Öymen’s case, only the initial of the first name is given, so the gender is not discernible. Because this person is, however, introduced as being a Member of Parliament for Istanbul, it is plausible to conclude that the author is pedagogue Fakihe Öymen, one of Turkey’s first female Members of Parliament, elected in 1935. Thus, probably three out of twenty authors are female, which reflects the general situation of early Republican academia: It was possible, yet still rare, for women to achieve an academic status that would allow them to publish in specialized journals. In fact, women are probably comparatively overrepresented in this specific sample. 17Thirteen of the authors were born before 1900 and thus had experienced the whole Second Constitutional Era with its aftermath until 1922 as adults.12 Seven were born in the twentieth century and accordingly had little or no personal adult recollections of the Second Constitutional Era, although some of them might have had vivid memories about the armistice era and the Turkish War of Independence.13 This generational mixture is not particularly surprising: It combines older, established authors and newcomers to the academic field in one journal. Still, with regard to writing about a recent past, it is interesting to keep in mind whether the respective author had active recollections of this era. It should be noted that within both generational groups, we find authors examining the Second Constitutional Era in-depth. Therefore, we cannot discern a generational difference regarding the readiness to assume the late Ottoman Empire as a research topic. 18In Issues 1 through 56 of Belleten, 33 articles mention the post-1908 Ottoman Empire. I chose the word mention, because not every article treats the Second Constitutional Era as its main topic or as a historiographical research subject in its own right. However, I found it insightful to also include in this analysis articles that devote only introductory remarks to the very recent past, or that mention it only in passing. 19Each issue of Belleten contains, on average, twenty articles.14 Thus, within 56 issues we find a total of approximately 1120 articles, of which the articles under study in this article constitute roughly three percent. For comparison, 27 articles mention the Tanzimat Era (1839-1876) and 29 articles mention the Hamidian Era (1876-1908).15 Articles on archeological and paleoanthropological subjects by far outnumber such figures. Further, it should be noted that in 1938, Belleten’s Issue 7/8 was dedicated to the Republic’s fifteenth anniversary. This special issue exclusively contains texts on recent history, which was, as the numbers show, rather atypical for Belleten in those decades. From within our sample, nine alone stem from Issue 7/8 (see Figure 1). 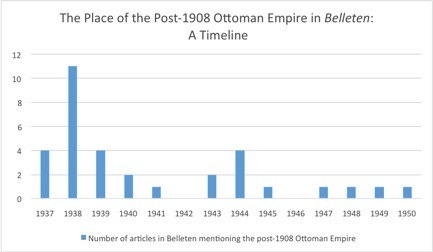 Figure 1: The post-1908 Ottoman Empire is continuously, but marginally, present in Belleten, with a peak at 1938 when one issue was dedicated to the Republic’s fifteenth anniversary and thus had a clear focus on recent history. 20The fact that late Ottoman history plays such a marginal role in Belleten once again shows that (late) Ottoman history was at most a secondary concern to early Republican state historiography, which was mainly pre-occupied with “developing a strong national conscience by relying on pre-Ottoman periods” (Ersanlı 1996: 12). It is even more conspicuous when we call to mind that exactly the recent past would have provided historians with a multitude of well-preserved and rather easily accessible source material to work with (Ersanlı 2002b: 153). As implied above, the focus of TTK, and of Belleten by proximity, lay on earlier historic periods, on archaeology and anthropology. The latter two disciplines were not only en vogue in a global context: In the Turkish case they furthermore provided the means to establish claims to a continuous Turkish presence in Anatolia, which was vital for the young state’s self-assertion against territorial claims by Armenia and Greece (Copeaux 1997: 50–51). The politically sensitive recent past, in contrast, was not a favorite topic. It is all the more interesting to investigate what and how authors in Belleten did write about the post-1908 Ottoman Empire, when they chose to include it in their representations of the past. 21Before starting a detailed analysis of the 33 articles, we have to establish which topics were actually represented in this sample (see Figure 2): When historians wrote about the Second Constitutional Era or the Armistice Period in Belleten, what exactly did they write about? Maybe not surprisingly, the most frequent single topic was the biography of Mustafa Kemal, which is the dominant theme in nine articles (Bayur 1939; Bilsel 1939; Göker 1939; İğdemir 1943; [İnan] 1937; İnan 1944, 1950; Kızıldoğan 1937; Öymen 1939). The Second Constitutional Era and the Armistice Period are of interest in these articles mostly as the scenery for Atatürk’s political, moral and military education, development and successes. Atatürk’s death falls within the period under examination, which produced a wave of work on his life and thoughts.16 Issue 10 in 1939 was even dedicated, as a special issue, to the memory of Mustafa Kemal. Just like Issue 7/8, this thematic focus is tangibly political: It is not self-evident that the death of a state president should be so present in a historiographical journal. We may conclude that early Republican state historiography, as represented in Belleten, was Kemalist in the narrow sense of being person-centered and depended on the belief that single great individuals can – and, in fact, do – change and steer the course of history. 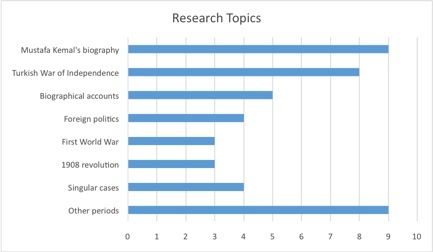 Figure 2: Mustafa Kemal’s biography and the Turkish War of Independence are the most widespread research topics represented in the sample. 22Biographical articles about Atatürk are closely followed by texts about the Turkish War of Independence,17 which is the predominant theme of eight articles (Bayur 1937; Türkiye tarihinin son 20 yıllık devrine ait kronoloji (14.X.1918-30.I.1921), 1938; Bayur 1939; Bilsel 1939; Göker 1939; [İnan] 1937, 1938a; Öymen 1939). Only one of the texts (Bayur 1937) builds a narrative in which Ottoman authorities and state institutions – more precisely, Foreign Minister Ahmed İzzet Paşa and Grand Vizier Tevfik Paşa of the Istanbul government – are primarily involved as relevant factors. The rest of the texts tell the story of the Independence Struggle purely from the perspective of the Anatolian movement. We thus find a certain tendency towards compartmentalizing ‘Ottoman’ and ‘(proto-)Republican’ history, even when they relate to synchronous events. 23In five articles, the Second Constitutional Era is woven into people’s biographies whithout being expressly marked as such, politically or otherwise. It is simply the time in which certain individuals (such as the linguist Ragıp Hulûsi Özdem or the archeologist Theodor Makridi) happen to live, go to school, publish books, or perform certain professional tasks (Koşay 1944; Ogan 1941; Özgüç 1948; Uzunçarşılı 1940b, 1945). Here, the Second Constitutional Era assumes a quality of biographic background noise. Four articles are concerned with foreign politics (Bayur 1937, 1938, 1943; Uludağ 1938), in which we encounter classical diplomatic history on the international status of the Bosphorus straits, discussions of the revocation of the capitulations, and examinations of the treaty of Sèvres. 24Only three articles within the sample focus on the First World War (Arat 1937; Bayur 1938; İğdemir 1943). It is not surprising that the number of texts on this topic is so small: It confirms the hypothesis that the First World War was for the most part overshadowed by the War of Independence in early Republican state historiography (Turan 2014: 252). Regarding the content of the articles, the successful battles of Gallipoli take pride of place, while unsuccessful campaigns, lost battles, and, indeed, the losing of the war, are treated in less detail. It might go without saying, but I would like to note that the Armenian Genocide is not mentioned within these texts. A further three articles elaborate on the 1908 revolution and its aftermath (İnan 1944, 1950; Kızıldoğan 1937). Strikingly, all three texts engage in a direct recounting of Mustafa Kemal’s personal experiences. More controversial themes, such as the 1909 attempt at counterrevolution or the 1913 coup d’état, are not present within Belleten. 25Four articles take up topics that no other text in the sample does: Only one focuses on the imperial household and the person of Sultan Mehmed V Reşad (Tansel 1949), one delves into medical history (Uludağ 1938), one concerns itself with the development of historical methodology (Uzunçarşılı 1938), and the last one tackles the changing conceptions of Turkish history itself and the developments in the field of historical research in Republican Turkey (Yücel 1944). 26Last but not least, nine articles only mention the Second Constitutional Era in passing, without going into much depth, while being chiefly concerned with another period (Barkan 1947; Göker 1938; Günaltay 1938; [İnan] 1938b, 1938c; Nedkoff 1944; Özer 1938; Sungu 1938; Uzunçarşılı 1940a). These articles provide us with a fresh and unexpected perspective regarding the complexity of the Second Constitutional Era’s historiographical image. That these short remarks are as numerous as articles about Atatürk’s life suggests that the predecessor regime, even if it was not the early Republic’s preferred historiographical topic in itself, still served as an important reference point – a somewhat inverse phenomenon to the one indicated by Etienne Copeaux in Espaces et Temps de la Nation Turque: He identifies instances in schoolbooks where “the historical narrative is interrupted and abruptly makes place for a reflection on recent history or for a quotation of Atatürk” (Copeaux 1997: 136). While in the case described by Copeaux, “the rapprochement expressed by the irruption of the present into the narrative of the past establishes the framework of official collective memory” (Copeaux 1997: 141), mentions of the late Ottoman past usually provide a dark contrast against which the progress and successes of the Republic can be shown all the more clearly (Günaltay 1938; [İnan] 1938b; Özer 1938; Sungu 1938), and at times also as a marked ending point of Ottoman decline, offsetting the Empire’s earlier, more glorious stages (Göker 1938; Uzunçarşılı 1940a). 27The most frequent historiographical genre within the sample is the obituary, with eight occurrences (Bayur 1939; Bilsel 1939; Göker 1939; Koşay 1944; Ogan 1941; Öymen 1939; Uzunçarşılı 1940b, 1945) (see Figure 3), which should not surprise us: We once again have to acknowledge the extraordinary surge of obituaries that Atatürk’s death provoked. What is more, it is only natural that the Second Constitutional Era should at least implicitly figure in almost every obituary, because it was a time span that people who died between 1937 and 1950 had typically lived through. Figure 3. Frequency of different historiographical genres within the sample. 28The obituaries are closely followed by archival document studies, of which we encounter seven (Bayur 1937, 1943; Nedkoff 1944; Özer 1938; Sungu 1938; Uludağ 1938; Uzunçarşılı 1940a). Only two, namely those by Hikmet Bayur,18 have the post-1908 Ottoman Empire as their central research objective. 29Another genre we find strikingly often is the rendition of Atatürk’s memoirs,19 first-hand or second-hand: This type of text appears five times within the sample (İğdemir 1943; [İnan] 1937; İnan 1944, 1950; Kızıldoğan 1937). Notably, two of these actually appeared – in a historiographic journal – before Atatürk’s death, which points to the fact that his life had, by the late 1930s, attained a historical quality, rather than being seen as purely contemporary. 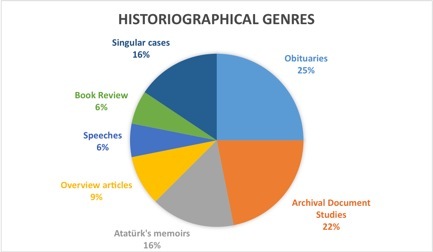 This finding indicates the larger trend within Turkish historiography that Atatürk’s own statements, memoirs and recollections were (and partly still are) taken as the undisputed main source base for most biographical writings on him (Zürcher 1984: 25–26). 30Three texts can be counted as historical overview articles, broadly introducing either a historical period or a specialized topic (Bayur 1938; Göker 1938; [İnan] 1938a). Two are programmatic speeches at academic congresses ([İnan] 1938c; Yücel 1944), a further two are book reviews (Barkan 1947; Tansel 1949). The rest is composed of singular cases: One summary of an interview ([İnan] 1938b), one presentation of a research institution (Özgüç 1948), one tabular chronology (Türkiye tarihinin son 20 yıllık devrine ait kronoloji (14.X.1918-30.I.1921), 1938), and one methodological reflection (Uzunçarşılı 1938). The two remaining cases are more likely to catch the reader’s eye: One is an openly apologetic text setting out to deconstruct the (many)20 criticisms directed at the Türk Tarih Tezi (Günaltay 1938). The other text distinctly ascribes a mythological quality to the battle of Gallipoli and presents it in the form of a menkıbe, a heroic legend (Arat 1937). Arat emphasizes that Mustafa Kemal himself ordered the writing of this menkıbe (Arat 1937: 20). That such a text, which is floridly written as an embellished personal recollection, should find its way into the pages of a historiographical journal is striking – all the more so because it is one of the first texts in the very first issue of Belleten. It thus helps setting the scene for the program of the new journal. 31The most fundamental question regarding the depiction of the post-1908 Ottoman Empire is, plainly, whether it was represented in a favorable or a negative light. It transpires that the image of this multifaceted timespan is more complex and cannot simply be put into one of those two categories, or, as Nicholas Danforth puts it, the Ottoman past is "amenable to multiple, often nuanced and contradictory, interpretations” (Danforth 2014: 655). 32The 1908 revolution in itself is viewed in a positive light and called a “freedom revolution”21 (İnan 1950: 507), an evaluation in accord with the larger tenor of contemporary political discourse, which celebrated the constitutional revolution as freeing the country from Abdülhamid II’s “tyranny”, and partly even ascribing the idea for the revolution to Mustafa Kemal personally (Kızıldoğan 1937; Zürcher 1984: 27–28). Certain early reforms of the Second Constitutional Era are depicted as real improvements, such as the abolition of the military tax for non-Muslims and the consequent introduction of general compulsory military service (Nedkoff 1944: 630). Another political decision with a positive evaluation is the abolition of capitulations before the First World War, which is seen as a measure furthering national welfare and independence (Göker 1938: 443; Uludağ 1938: 461). The constitutional system in itself is depicted as a quasi-secular project, on the grounds that it was purportedly opposed by religious scholars, who Sungu characterizes as having a “backward mindset”22 (Sungu 1938: 420). In contrast, in the same article, Sungu portrays the şeyhülislam in a progressive light, because he tried to modernize medrese education (Sungu 1938: 421–422). It is indicative of the state discourse’s ambiguous relationship toward religion that Sungu had trouble placing religion as either a reactionary force or an integral part of the worldview of late Ottoman reformers otherwise deemed progressive (Ersanlı 2002b: 145–146, 152-153). 33The evaluation shifts as soon as we move forward into the middle 1910s: Muzaffer Göker still sees the constitutional government as a well-meaning force that “worked with good intentions in order to save the situation, made many efforts, but this, too, was not sufficient”23 (Göker 1938: 434). The government’s reform projects could not succeed, but it was not their fault: Unfavorable circumstances, like recurrent wars, internal conflict and the negative Hamidian legacy impeded their success. Statements such as this can be interpreted as a cautious move towards a more positive assessment of the Young Turks as precursors of Republican ideals, now that “the Unionists and their memories ceased to pose an immediate threat to the Kemalist establishment” (Gürpınar 2011: 55). 34A more negative outlook, still related to war and military institutions, is given by Âfet İnan, who portrays the Ottoman army during and before the First World War as too obedient to its foreign military advisers and lacking national self-confidence. In her assessment, it is obvious that in the Ottoman army – and in the state system more generally – the wrong people made it to the top, and that the real ingenuity of the Turkish people could only be found in the lower ranks (İnan 1950: 508–509). 28 Original: “düşmanlara her türlü yardımı yapmağa hazır bir padişah”. 29 Original: “hattâ milletile harp halinde bulunan bir devletin”. 36This is strong language and it makes the point of definite alienation clear: Whoever stayed in a government position after the revocation of the constitution in 1920 was a traitor who had forfeited the right to belong to the collective identity of the Turkish nation. The Istanbul government of the armistice era is indeed depicted as being so alienated that it is closer to the foreigners and their ideas than to their own people: “They don’t shy away from facilitating the achievement of our enemies’ goals.”27 Also the sultan is seen as a traitor, as “a ruler who is ready to lend the enemies all kinds of help.”28 The state is “even at war with the nation”29 (Bayur 1937: 450–453). 30 Original: “kısmen şuursuz fakat kısmen de şuurlu bir alettir”. 38As is clearly visible, the same qualifications are not used for negative assessments, which are voiced directly. 32 Original: “bir şahsın değil, bir rejimin fikirleridir” / “tesadüf”. 33 Original: ”hata, Abdurrahman Şeref merhuma has değildi”. 39Although we find such examples of personal attacks, it is for the most part acknowledged that the problems of the regime were not due to specific individuals, but were of a more structural nature. They were “not the thoughts of an individual, but the thoughts of a regime”. Who takes responsibility for certain political acts is up to “coincidence”32 (Bayur 1937: 452). The idea of structurality is not restricted to negatively evaluated fields. We also find more benign examples, as in Yücel’s opening speech to the Second Turkish History Congress: He refers to the last Ottoman imperial annalist Abdurrahman Şeref in a positive way, stating that “he has taught history in its broad sense to several generations and has left a clean name in our cultural life”. However, Abdurrahman Şeref was also not considered immune to misconceptions about the origin and character of the Turkish people – “this fault is not peculiar to the late Abdurrahman Şeref”,33 but rather structurally imbued in the belief system and society surrounding him (Yücel 1944: 11–12). 40Overall, we see an ambivalent approach to the recent past: In certain respects, especially regarding reform movements, currents and agents from the Young Turk era are seen as predecessors whose agenda is logically continued in the Republican era. The closer we come to the proclamation of the Republic, however, the more reprehensible the central Ottoman state actors are portrayed. 41A topic that keeps arising in Belleten is the role of science, research, and scientifically sound methods in the predecessor regime. The Second Constitutional Era is represented in a predominantly positive fashion as the intellectual precursor of the scientific and scholarly ‘revolution’ in the Republic of Turkey. For example, İsmail Hakkı Uzunçarşılı, whom Büşra Ersanlı calls one of the “major nationalist historians of the period” (Ersanlı 2002b: 126), claims that the method of writing history through archival studies and critical analysis of documents and manuscripts was an innovation made during the constitutional years. The Second Constitutional Era is portrayed as a period of progress concerning historiographical methodology, although the scholarly methods of source-based historiography are still represented as a restricted, even elitist, practice, before becoming more wide-spread only with the Republican educational reforms (Uzunçarşılı 1938: 370–371). Coming from Uzunçarşılı, who highly valued historical professionalism (Ersanlı 2002b: 147–149), this assessment takes on the meaning of an intellectual genealogy that reaches back into Ottoman times – probably not least because he himself was educated at Darülfünun. In another scientific field, namely that of medicine, Osman Şevki Uludağ emphasizes the success of the Ottoman medical community: “In the Great War, Turkish doctors showed their ability by overcoming big epidemics under the most difficult conditions.”34 These Turkish doctors are expressly represented as superior to their French counterparts concerning their scientific progress and technical adeptness (Uludağ 1938: 460–461). As discussed above, commendatory mention is made of the şeyhülislam’s efforts to reform medrese education by considerably prolonging its curriculum and including subjects like natural sciences, history, and geography (Sungu 1938: 420–421). 42Thus, the Second Constitutional Era is not per se depicted as an educational dark age. We find, however, conflicting views, notably in Sungu’s article “Tevhidi Tedrisat” [The Unification of Instruction], which, incidentally, is mainly concerned with Republican education reforms and thus uses the Second Constitutional Era as a dark contrasting foil against which the colors of the Republican progress could shine all the more brightly. When the revolutionary character of the Republican reforms and innovations is at stake, ideas of continuity and genealogy, cautiously voiced in other contexts, are left aside. 35 Original: “eski devrin hurafatından”. 38 Original: “talebeye ilmî zihniyet vermekten nekadar uzak”. 44Here, the Second Constitutional Era is clearly depicted as unscientific, at least within its institutions that are characterized as “far from providing a scholarly mentality for the students”38 (Sungu 1938: 410). 45Again, just like in the overall evaluation of the post-1908 Ottoman Empire, Sungu also depicts the realm of education and research in a somewhat ambiguous and paradox light, with religion and elitism marked as the predominant impediments to true progress. 46Lastly, let us turn to the question of to what extent the late Ottoman Empire is considered ‘history’ in our sample of articles. History does not pre-exist historiography, but it is constructed and stands in a dynamic relationship with different kinds of pasts (such as memory or ‘recent events’). Past-as-history has to be demarcated from the present. The line between both is not self-evident, especially when a recent past is the focus. This brings us to the question of how historicity is marked within Belleten, and how ruptures and continuities are constructed. 48Within the quote, which Sungu chose to include in his article, we encounter several points worth noting: Apart from the decline rhetoric, we find the question of the authenticity of history. The past is rhetorically devalued, but at the same time, national history and national character are idealized. This specific quote forms part of a rhetoric that propounds an elliptic view of history, in which the Ottoman Empire would not be seen as a part of ‘real’ Turkish history, but as an interregnum of sorts (Copeaux 1997: 140–141; Ersanlı 2002b: 141). Often, however, the lines are not as clear-cut, and it is not as easy to determine which parts of the past should be dismissed and which could be appropriated. This ambiguous approach to historicity shapes much of historical thinking within Belleten, which also distinguishes the journal from more popular publications and magazines, in which the decline paradigm was replicated in a less complex and more unfiltered way (Ersanlı 2002b: 145). 49In his speech, Yücel speaks of a “history revolution”41. He argues that the new way of perceiving history developed as a direct reaction to the Ottoman notion, which relegated Turks to the less honorable positions in world history (Yücel 1944: 11). With this assessment, he acknowledges the revisionist character of nationalist historiography. The change in historical perception also plays a role in Uzunçarşılı’s article “Yeni Türk tarihinde vesikacılık” [The Use of Documents in New Turkish History]. In this text, it becomes obvious that late Ottoman historiography had predominantly been occupied with recent pasts (Uzunçarşılı 1938: 371, see also Kafadar and Karateke 2011: 567). The historiographical shift to prehistory and protohistory might thus not only have been an avoidance of the politically sensitive immediate past, but also a departure from former scholarly standards, that is, a paradigm shift (Blanke 1991: 39–41), albeit one that had already been prepared in the Young Turk era (Kafadar and Karateke 2011: 572). 50Uzunçarşılı himself outlines certain continuities between the two systems, because he sees the intellectual precursors of the paradigm shift within the Second Constitutional Era, specifically mentioning the historian Ahmed Refik and the maritime historian Saffet Bey. We also find a logic of continuity in biographical narratives such as obituaries: In those texts, the historical break between Empire and Republic is not even marked separately. Another notion of continuity is constructed when Göker describes the impact that the First World War had upon Ottoman society, using an emotional strategy: “After this, the general war years came with unforgettable catastrophes and [hitherto] unfelt anguish, and left the collapsing Ottoman Empire in a state that was so sad that nation and fatherland had not seen the like of it”42 (Göker 1938: 434). The almost melancholy narrative evokes a sense of continuity and belonging: The Ottoman pain is appropriated; the suffering reverberates until the present day. In general, we encounter the notion that the continuity lies in the Turkish people (or nation), not in the ruling elite or in the state system. 44 Original: “bu lâyihanın yazılmasını icap ettiren rejim ise tarihe gömülmüştür”. 52The perspective is fundamentally different once we analyze the texts that are centered around the life and deeds of Mustafa Kemal. Celâl Arat’s “Tarihe geçmiyen bir kahramanlık ve büyüklük menkıbesi” [A Heroic Legend that Did Not Enter History] is a particularly interesting example. It can be seen as part of the project to install Mustafa Kemal as a central historical actor not only of Republican, but also of late Ottoman history: The Gallipoli battle of the First World War is incorporated into a Republican salvation history and serves as an extension to the War of Independence, preponing its starting point, from Nutuk’s notorious 19 May 1919 ([Atatürk] 1927: 1), well into the Ottoman period.48 In this way, the discourse in Belleten is resembling the one in history textbooks, where Copeaux established that “Çanakkale is already part of the Kemalian feat” (Copeaux 1997: 292) and that “its martyrs are not sacrificed for the Ottoman Empire, but for the Republic that announces itself” (Copeaux 1997: 290). Ottoman and Republican history are thereby each relegated to watertight compartments. Although in Arat’s text, historicity is even surpassed and sublimated into the mythical, the many Atatürk memoirs that are narrated within Belleten construct a similar picture: Life and biography of Atatürk serve as important cornerstones for a Republican salvation history, and a strong sense of continuity is evoked with periods that precede the proclamation of the Republic and even the Armistice Era: The chain of continuity reaches well into the First World War and even into the Hamidian period. The same period, however, is treated as distant past by Bayur, when the subject at hand is the armistice cabinet, rather than the life of Atatürk. The presence of Mustafa Kemal alone suffices to ‘Republicanize’ history that would otherwise have been connoted as Ottoman. 53The difference is also marked on a methodological level: Personal memory is treated as an important source for writing about Mustafa Kemal’s biography – a topic that was already perceived as historical while Atatürk was still alive. Everything that surrounds Atatürk lets personal memory acquire a historical value and a claim to accuracy that surpasses the mere anecdotal. Articles on Mustafa Kemal constitute a clear exception within Belleten: Only here is personal memory valid as a legitimate source. Ottoman history, even if it concerns the very recent past, is written with exclusive reference to written and archival sources, and is thereby historicized methodologically. We can thus speak of two different aspects of Belleten’s regime of historicity, one that takes care that the past is not “too insistently recalled” (Hartog 2015: 16) and one that binds the past to the present by reviving it and integrating memory and history. 54Although the rupture with the Ottoman past is emphasized within Belleten, no clear turning point between the Ottoman and the Republican era is unambiguously established. Belleten’s discourse tends to incorporate specific instances of the Ottoman past into a Republican genealogy, thereby creating two distinct parallel temporal categories, one as ‘Ottoman history’, the other as ‘Republican history’. This goes against Gürpınar’s claim that “[o]ne of the primary concerns of Kemalism was presenting 1923 as year zero without any pre-history” (Gürpınar 2013: 196): Especially the Armistice Period can be interpreted as a time frame during which the synchronicity of Ottoman and Republican history becomes visible, although the Republican character is predominantly emphasized. This is reinforced by the chronology provided in Belleten’s 1938 volume (Türkiye tarihinin son 20 yıllık devrine ait kronoloji (14.X.1918-30.I.1921), 1938): Here, events relating to the Istanbul government are also included, but events connected to the Anatolian movement and Ankara government are predominant. The compartmentalization further reinforces the regime of historicity in the consolidating Republic of Turkey: The late Ottoman Empire is framed as belonging to a distant history, even though it is yet so near to the lives of the historians, or, as Ersanlı put it, “Ottoman history remained close to the minds if not the hearts, of Republican historians” (Ersanlı 2002b: 154). 55Belleten’s historiography on the recent past is part of a highly politicized and nationalized discourse. The periodical forms a discursive space whose agents are closely linked to the realm of formal political decision-making; the nationalist and the scholarly discourse are porous and overlapping. The nationalist historiography practiced in Belleten fulfills a discrete function within the nation-building process of constructing a new reality and a nationalist relationship with the past by trying to clearly differentiate Turkish from Ottoman history. Belleten’s regime of historicity is constructed by the notion of an Ottoman and a Republican history that overlap temporally and run side by side synchronically for some time – and that these two historical currents can ideally be clearly demarcated one from the other. This is also why a clear breaking point between Ottoman and Turkish history is not established within Belleten’s discourse: Instead, the two parallel historical spheres run side by side over the course of more than a decade, without touching each other or intermingling. 56The findings from this article are directly applicable only to Belleten and should not be misinterpreted as pertaining to all of Republican historiography in the late 1930s and 1940s, not even to all of resmî tarih. Still, an ambivalent approach to the recent past is not unique to Belleten. It connects to a larger phenomenon of state historiography. The interconnections are by no means arbitrary, given that Belleten held such a central place within the discourse of resmî tarih, and that many of its contributors were not only politically active and influential, but also greatly involved in other central historiographic projects, such as the compilation of history textbooks and of the programmatic Türk Tarihinin Ana Hatları. 57In his analysis of history textbooks, Copeaux has identified the same ambivalence toward the late Ottoman Empire (especially to the First World War), and found it persistent until the 1980s and 1990s (Copeaux 1997: 290–292). Ahmet Kuyaş, in an analysis of similar material, shows that the general shift toward a more positive evaluation of the past that occurred from the 1950s onwards did not extend to the Second Constitutional Era, which continued to lead a shadowy existence in Turkish textbooks (Kuyaş 2008: 51–52). However, Copeaux also points to the fact that schoolbooks characteristically demonstrate a significant ‘time lag’ in incorporating discursive changes and developments that take place in a larger historiographical, specifically academic, field (Copeaux 1997: 19). Further research could investigate to what extent the compartmentalization of late Ottoman history still reverberates today. When we look at its point of origin, though, it is clear that the approach was not ‘invented’ by Belleten: Already the 1932 high school history textbook Tarih 3: Yeni ve Yakın Zamanlar [History 3: Modern and Contemporary History] distinguishes, in its narration of the First World War, between a generally negative assessment of the army command (Türk Tarihi Tetkik Cemiyeti 1933: 305–308) and an excursus on Mustafa Kemal’s feat, again with a mythical touch (Türk Tarihi Tetkik Cemiyeti 1933: 307–308). The extension of the Republican genealogy to a time before 1919 seems to be a product of the early 1930s: It is rather absent in Tarih 3’s predecessor work Türkiye Tarihi [History of Turkey] from the 1920s, in which Mustafa Kemal is positively mentioned in the narration of Gallipoli, but is not in any way as central as in the later texts: the collectivity of the army is more important here ([Ahmet] Hâmit and [Mustafa] Muhsin 1930: 721; originally published in 1924, reprinted in 1926 and latinized in 1930). Also Nutuk famously defines the beginning of Republican history as May 1919, a practice Türk Tarihinin Ana Hatları follows (Türk Tarihi Heyeti 1930: 605–606). 58By the 1930s, the state historiographical discourse had consolidated to an extent that made it possible to re-appropriate larger parts of the recent past and to make them part of a specifically Republican salvation history, centered around the person of Mustafa Kemal and his deeds. Gürpınar’s assertion that a “domesticated, sterilized, and polished imagery of the Ottoman Empire, sanctioned by the republic and compatible with republican and national mores, does not pose a challenge to the historical legitimacy of the republic” (Gürpınar 2011: 39) thus also holds true for the latest stage of the Empire: The past was re-fashioned according to the Republic’s needs, and given a genealogical quality. A comparative look at Tarih Vesikaları confirms that in the early 1940s, the idea of a person-centered Republican genealogy was well-established, while, contrarily, we find no articles about ‘Ottoman’ aspects of the post-1908 Ottoman Empire. Even the Amasya Protocols,49 which as a source evidently defy the clear-cut compartmentalization of ‘Republican’ and ‘Ottoman’ history, are published only in Tarih Vesikaları’s last issue in 1961, at a time when the Turkish historiographical discourse had considerably shifted toward a greater readiness to address issues of the late Ottoman Empire (Unat 1961). 59Coming back to Belleten and the texts investigated in this article, it is furthermore noteable that no significant shift in the representation and evaluation of the post-1908 Ottoman Empire occurred. While Kemalism was re-appraised after Mustafa Kemal’s death in other discourses, at least within Belleten, the Kemalist narrative of salvation still persevered. This reaffirms the supposition of Belleten as one of the cornerstones of resmî tarih, the discursive field where nationalist historiography “provide[d] a context for […] reforms and strengthen[ed] the self-image of the republic” (Foss 2014: 826). 60In order to substantiate the findings from this article for the larger field of resmî tarih, and to juxtapose them with a broader historiographic discourse in the consolidating Republic of Turkey, more research remains to be done on a wider array of sources.50 This is, however, not the only direction in which the present findings can be expanded. There is also much room for studies examining the discursive space of Belleten more thoroughly, and with regard to other analytical categories or thematic foci: Belleten provides a gateway into the continuous creation and re-negotiation of what state historiography meant and means in Republican Turkey. It should not remain understudied. [Ahmet] Hâmit; [Mustafa] Muhsin (1930). Türkiye Tarihi, Latinized and slightly enhanced edition of the 1924 original, Istanbul, Devlet Matbaası. Aktürk, Ahmet Serdar (2010). “Arabs in Kemalist Turkish Historiography”, Middle Eastern Studies 46 (5), pp. 633–653. Arat, Celâl (1937). “Tarihe Geçmiyen Bir Kahramanlık ve Büyüklük Menkıbesi”, Belleten 1 (1), pp. 20–25. Arı, Başar (2013). “Religion and Nation-Building in the Turkish Republic: Comparison of High School History Textbooks of 1931-41 and of 1942-50”, Turkish Studies 14 (2), pp. 372–393. [Atatürk], Mustafa Kemal (1927). Nutuk, Ankara, Devlet Matbaası. Barkan, Ömer Lütfi (1947). “L’Empire du Levant. Histoire de la Question de l’Orient : By René Grousset”, Book Review, Belleten 11 (41), pp. 150–159. Bayur, Hikmet (1937). “Son Osmanlı Hariciye Nâzırının Bir Lâyihası”, Belleten 1 (2), pp. 449–499. Bayur, Hikmet (1938). “Son Yirmi Beş Yıllık Tarihimize Bakışlar”, Belleten 2 (7/8), pp. 309–335. Bayur, Hikmet (1939). “Atatürk”, Belleten 3 (10), pp. 247–268. Bayur, Hikmet (1943). “Boğazlar Sorumunun Bir Evresi (1906-1914)”, Belleten 7/2 (28), pp. 89–217. Bilsel, Cemil (1939). “Atatürk, Yaptıklarile de, Anlattıklarile Büyüktür”, Belleten 3 (10), pp. 169–174. Blanke, Horst Walter (1991). Historiographiegeschichte als Historik, Bad Cannstatt, Frommann-Holzboog. Bouquet, Olivier (2016). “Du déclin à la transformation : Réflexions sur un nouveau paradigme en histoire ottomane”, Revue d'Histoire du XIXe siècle (53), pp. 117–136. Brandenstein, Wilhelm (1937). “Etrüsklerin ve Tyrrhenlerin En Eski Tarihine Ait Dil Tetkikleri”, Belleten 1 (3/4), pp. 677–751. Çağaptay, Soner (2004). “Race, Assimilation and Kemalism: Turkish Nationalism and the Minorities in the 1930s”, Middle Eastern Studies 40 (3), pp. 86–101. Copeaux, Étienne (1997). Espaces et Temps de la Nation turque : Analyse d’une historiographie nationaliste, 1931-1993, Paris, CNRS. Danforth, Nicholas (2014). “Multi-Purpose Empire: Ottoman History in Republican Turkey”, Middle Eastern Studies 50 (4), pp. 655–678. Eberhard, W. (1940). “Muahhar Han Devrinde (M.S. 25-M.S 220) Hun Tarihine Kronolojik Bir Bakış”, Belleten 4 (16), pp. 337–441. Ersanlı, Büşra (1996). İktidar ve Tarih: Türkiye’de “Resmi Tarih” Tezinin Oluşumu (1929-1937), Istanbul, AFA Yayınları. Ersanlı, Büşra (2002a). “History Textbooks as Reflections of the Political Self: Turkey (1930s and 1990s) and Uzbekistan (1990s)”, International Journal of Middle East Studies 34 (2), pp. 337–349. Ersanlı, Büşra (2002b). “The Ottoman Empire in the Historiography of the Kemalist Era: A Theory of Fatal Decline”, in Adanır, Fikret; Faroqhi, Suraiya (eds. ), The Ottomans and the Balkans: A Discussion on Historiography, Leiden, Brill, pp. 115–154. Foss, Clive (2014). “Kemal Atatürk: Giving a New Nation a New History”, Middle Eastern Studies 50 (5), pp. 826–847. Garstang, J. (1941). “Arzawa ve Lugga Memleketlerine Ait Bir Hatıra”, Belleten 5 (17/18), pp. 17–46. Göker, Muzaffer (1938). “Türklerde Sanayi”, Belleten 2 (7/8), pp. 433–444. Göker, Muzaffer (1939). “Atatürk’ün Huzurunda”, Belleten 3 (10), pp. 385–388. Günaltay, Şemseddin (1938). “Türk Tarih Tezi Hakkında Intikatların Mahiyeti Ve Tezin Kat’î Zaferi”, Belleten 2 (7/8), pp. 337–365. Gürpınar, Doğan (2011). “Double Discourses and Romantic Ottomanism: The Ottoman Empire as a ‘Foreign Country’”, International Journal of Turkish Studies 17 (1/2), pp. 39–63. Gürpınar, Doğan (2013). Ottoman/Turkish Visions of the Nation, 1860-1950, Basingstoke, Palgrave Macmillan. Gürpınar, Doğan (2015). “Turkish Radicalism and its Images of the Ottoman Ancien Régime (1923-38)”, Middle Eastern Studies 51 (3), pp. 395–415. Hartog, François (2005). “Time and Heritage”, Museum International 57 (3), pp. 7–18. Hartog, François (2015). Regimes of Historicity: Presentism and the Experience of Time, Translated by Saskia Brown, New York, Columbia University Press. Hendrich, Béatrice (2004). “’Endzweck der Geschichte, die von der Theologie über die Metaphysik zur positiven Wissenschaft fortschreitet, ist Glückseligkeit.’: Eine Rede von Mustafa Kemal Paşa über die Aufhebung des Sultanats”, in Hartmann, Angelika (ed. ), Geschichte und Erinnerung im Islam, Göttingen, Vandenhoeck & Ruprecht, pp. 243–257. İğdemir, Uluğ (1943). “Atatürk’ün Anafartalar Muharebelerine Ait Hâtıraları”, Belleten 7/2 (28), pp. 1–88. İğdemir, Uluğ (1973). Cumhuriyetin 50. Yılında Türk Tarih Kurumu, Ankara, Türk Tarih Kurumu Yayınları. [İnan], Âfet (1937). “Atatürk'ü Dinlerken: Gerilla Hakkında Iki Hâtıra”, Belleten 1 (1), pp. 10–14. [İnan], Âfet (1938a). “Türk istiklâli ve Lozan muahedesi”, Belleten 2 (7/8), pp. 277–291. [İnan], Âfet (1938b). “Türk Tarih Kurumu Asbaşkanı Bayan Prof. Âfet’le Mülâkat: 9 Eylül 1937 Tarihli Kurun’dan”, Belleten 2 (5/6), pp. 253–256. [İnan], Âfet (1938c). “Türk-Osmanlı Tarihinin Karakteristik Noktalarına Bir Bakış”, Belleten 2 (5/6), pp. 123–132. [İnan], Âfet (1939). “Atatürk ve Tarih Tezi”, Belleten 3 (10), pp. 243–246. İnan, Âfet (1944). “Atatürk’ü Dinledim: Trablusgarp’ta Hürriyete Karşı Isyan”, Belleten 8 (31), pp. 387–401. İnan, Âfet (1950). “Atatürk’ü Dinledim: ‘Kumandanlar Madunlarından Yüksek ve Âlim Olmalıdırlar’”, Belleten 14 (56), pp. 507–514. Kafadar, Cemal; Karateke, Hakan T. (2011). “Late Ottoman and Early Republican Turkish Historical Writing”, in Macintyre, Stuart; Maiguashca, Juan; Pók, Attila (eds. ), The Oxford History of Historical Writing: Volume 4: 1800-1945, Oxford, Oxford University Press, pp. 559–577. Kızıldoğan, Hüsrev Sami (1937). “Vatan ve Hürriyet = İttihat ve Terakki”, Belleten 1 (3/4), pp. 619–625. Koşay, Hamit Zübeyr (1944). “Ragıp Hulûsi Özdem: 1893-1943”, Belleten 8 (29), pp. 149–150. Kuyaş, Ahmet (2008). “II. Meşrutiyet, Türk Devrimi Tarihi ve Bugünkü Türkiye”, Doğu Batı (45), pp. 49–64. Maasen, Sabine (2009). Wissenssoziologie, Bielefeld, transcript-Verlag. Millas, Hercules (2008). “History Writing among the Greeks and Turks: Imagining the Self and the Other”, in Berger, Stefan; Lorenz, Chris (eds. ), The Contested Nation: Ethnicity, Class, Religion and Gender in National Histories, Basingstoke, Palgrave Macmillan, pp. 490–510. Nedkoff, Boris Christoff (1944). “Osmanlı İmparatorluğunda Cizye (Baş Vergisi)”, Belleten 8 (32), pp. 599–652. Ogan, Aziz (1941). “Th. Makridi’nin Hâtırasına”, Belleten 5 (17/18), pp. 163–169. Öymen, F. (1939). “Atatürk Türk Milletinin Kalbinde, Türk Milletinin Ruhunda Kendine Güvenme Kudretini Yarattı”, Belleten 3 (10), pp. 281–283. Özer, Yusuf Ziya (1938). “Cumhuriyette Hukuk İnkılâbı”, Belleten 2 (7/8), pp. 379–396. Özgüç, Tahsin (1948). “İngiliz Arkeoloji Enstitüsü”, Belleten 12 (45), pp. 267–270. Pittard, Eugène (1938). “Neolitik Devirde Küçük Asya İle Avrupa Arasında Antropolojik Münasebetler”, Belleten 2 (5/6), pp. 19–38. Przeworski, Stefan (1938). “Varşova'da Tarsustan Gelme Bronzdan Bir Boğa Heykelciği”, Belleten 2 (5/6), pp. 183–189. Quataert, Donald (2003). “Ottoman History Writing and Changing Attitudes Toward the Notion of ‘Decline’”, History Compass 1 (1), pp. 1–9. Rásonyi, Lá (1938). “Ortaçağ'da Erdelde Türklüğün İzleri”, Belleten 2 (5/6), pp. 107–122. Serin, Sinem; Boztaş, Fırat (2011). “Tarih Vesikaları Dergisi Bibliyografyası”, Tarih Dergisi (53), pp. 351–365. Sungu, İhsan (1938). “Tevhidi Tedrisat”, Belleten 2 (7/8), pp. 397–431. Szurek, Emmanuel (2013). “Le linguiste et le politique : La Türk Dil Kurumu et le champ du pouvoir à l'époque du parti unique”, in Aymes, Marc; Gourisse, Benjamin; Massicard, Élise (eds. ), L'art de l'État en Turquie: Arrangements de l'action publique de la fin de l'Empire ottoman à nos jours, Paris, Karthala, pp. 75–101. Tansel, Fevziye Abdullah (1949). “Saray ve ötesi, volumes 1-3: By Halit Ziya Uşaklıgil”, Book Review, Belleten 13 (50), pp. 356–361. Turan, Ömer (2014). “Turkish Historiography of the First World War”, Middle East Critique 23 (2), pp. 241–257. Türk Tarihi Heyeti (1930). Türk Tarihinin Ana Hatları, Istanbul, Devlet Matbaası. Türk Tarihi Tetkik Cemiyeti (1933). Tarih 3: Yeni ve Yakın Zamanlar, (Original Edition: 1932), Istanbul, Devlet Matbaası. “Türkiye tarihinin son 20 yıllık devrine ait kronoloji (14.X.1918-30.I.1921)” (1938), Belleten 2 (7/8), pp. 469–489. Uludağ, Osman Şevki (1938). “Son kapitülasyonlardan biri: Karantina”, Belleten 2 (7/8), pp. 445–467. Unat, Faik Reşit (1941a). “Anadolu ve Rumeli Müdafaa-ı Hukuk Cemiyetinin Kuruluşuna Dair Vesikalar”, Tarih Vesikaları 1 (1), pp. 3–9. Unat, Faik Reşit (1941b). “Anadolu ve Rumeli Müdafaa-ı Hukuk Cemiyetinin Kuruluşuna Dair Vesikalar”, Tarih Vesikaları 1 (2), pp. 81–90. Unat, Faik Reşit (1942a). “Atatürk'ün Ankara'ya Gelişi”, Tarih Vesikaları 2 (10), pp. 241–252. Unat, Faik Reşit (1942b). “Atatürk'ün Askerlik'ten İstifası ve Millî Savaşa Millet Ferdi Olarak Başlaması”, Tarih Vesikaları 1 (5), pp. 321–325. Unat, Faik Reşit (1942c). “Mustafa Kemal Paşa'nın Türkiye Büyük Millet Meclisi Orduları Başkumandanlığına tayini ve Kendilerine Müşürlük Rütbesiyle Gazilik Unvanının Verilmesi Hakkında Bazı Vesikalar”, Tarih Vesikaları 2 (8), pp. 81–100. Unat, Faik Reşit (1942d). “Türkiye Büyük Millet Meclisi Hükûmeti'nin Kuruluşuna Ait Bazı Vesikalar”, Tarih Vesikaları 1 (6), pp. 401–406. Unat, Faik Reşit (1942e). “Türkiye Devletinin Makarr-i İdaresi Ankara Şehridir”, Tarih Vesikaları 2 (9), pp. 161–165. Unat, Faik Reşit (1943). “Mustafa Kemal Paşa'ya Dokuzuncu Ordu Kıtaatı Müfettişi Sıfatiyle Verilen Vazife ve Salâhiyetlere Dair Bazı Vesikalar”, Tarih Vesikaları 2 (12), pp. 401–409. Unat, Faik Reşit (1944). “Türkiye Büyük Millet Meclisinin Birinci Devresinde Anadolu ve Rumeli Müdafaa-i Hukuk Grupunun Kuruluşuna ve Çaılşmalarına Ait Bazı Vesikalar”, Tarih Vesikaları 3 (13), pp. 1–15. Unat, Faik Reşit (1949). “Anadolu ve Rumeli Müdafaa-ı Hukuk Cemiyetinin Kuruluşuna Dair Vesikalar”, Tarih Vesikaları 3 (15), pp. 161–170. Unat, Faik Reşit (1961). “Amasya Protokolleri”, Tarih Vesikaları Yeni Seri 1 (3 ), pp. 359–365. Uzunçarşılı, İsmail Hakkı (1938). “Yeni Türk Tarihinde Vesikacılık”, Belleten 2 (7/8), pp. 367–371. Uzunçarşılı, İsmail Hakkı (1940a). “Osmanlı Devleti Zamanında Kullanılmış Olan Bazı Mühürler Hakkında Bir Tetkik”, Belleten 4 (16), pp. 495–544. Uzunçarşılı, İsmail Hakkı (1940b). “Türk İlim Âleminde Dört Büyük Kayıptan İkisi: Üstad A. Tevhid”, Belleten 4 (13), pp. 141–143. Uzunçarşılı, İsmail Hakkı (1945). “Fevzi Kurdoğlu”, Belleten 9 (36), pp. 505–508. Yücel, Hasan-Âli (1944). “Kongre Başkanı Maarif Vekili H.-A. Yücel’in nutku”, Belleten 8 (29), pp. 11–14. Zorlu-Durukan, Akile (2006). The Ideological Pillars of Turkish Education: Emergent Kemalism and the Zenith of Single-Party Rule, Dissertation, Madison. Zürcher, Erik J. (1984). The Unionist Factor: The Role of the Committee of Union and Progress in the Turkish National Movement 1905-1926, Leiden. Zürcher, Erik J. (2003). “The Young Turks - Children of the Borderlands?”, International Journal of Turkish Studies 9 (1-2), pp. 275–286. Zürcher, Erik J. (2012). “The Historiography of the Constitutional Revolution: Broad Consensus, Some Disagreement, and a Missed Opportunity”, in Georgeon, François (ed. ), L’Ivresse de la liberté: La révolution de 1908 dans l’Empire ottoman, Paris, Louvain, Walpole MA, Peeters, pp. 91–106. 1 All translations in this article are my own, unless otherwise stated. Original citations in Turkish can be found in the footnotes. (In the case of translations from other languages, notably French, the original is not provided.) Here, the original reads: "Atatürk Milletine büyük inkılâplar hediye etti. Bu inkılâplardan biri de tarih üzerinde oldu." 2 The Turkish History Congresses undisputedly occupy a similarly important place. Yet, these congresses are of a different, more infrequent and accentuated nature than the regular and continuous discourse within Belleten. 3 A short look into the relevant issues of Belleten will suffice to see that especially in the fields of archeology and anthropology, contributions by Western and Eastern European authors are quite numerous. Examples include, but are not limited to, articles by the British archeologue John Garstang (1941), the German émigré Sinologist Wolfram Eberhard (1940), the Polish archeologue Stefan Przeworski (1938), the Swiss anthropologist Eugène Pittard (1938), the Hungarian émigré Turkologist Laszlo Rásonyi (1938) and the Austrian linguist Wilhelm Brandenstein (1937). 4 It must be noted that the selection of authors covered within this paper is not necessarily representative for the group of Belleten contributors as a whole: Another thematic focus than the post-1908 Ottoman Empire (for example archeology) would yield somewhat different results to the ones presented here. 7 It is an interesting sidenote that, apart from Fakihe Öymen (who was born in present-day Shkodër but had lived in Istanbul since her childhood), none of these parliamentarians seems to have had a close personal or biographical connection to their electoral districts. The question as to whether this observation applies to Kemalist deputies on a more general level is, unfortunately, beyond the scope of this article. 8 A similar overlap of parliamentarians and of scholarly personalities has been shown by Emmanuel Szurek for the leading echelons of the Türk Dil Kurumu [Turkish Language Association], comp. Szurek (2013: 81, 92-93). 9 I have not been able to confirm biographical data for Nedkov. He has published primarily on Ottoman diplomatics and paleography, between the 1940s and 1960s. 10 Koşay was actually of Bashkir origin – one example for the importance of the “wave of emigration of scholars from former imperial Russia [which] brought some of the best-trained Turcologists to Turkey”, comp. Kafadar and Karateke (2011: 574). 11 My thanks to Zaur Gasimov for pointing me into the direction of possible muhacir backgrounds, which are a common feature in late Ottoman as well as early Republican society, especially among Young Turk Circles, comp. Zürcher (2003). 12 C. Arat, born 1883; H. Bayur, born 1891; C. Bilsel, born 1879; M. Göker, born 1888; Ş. Günaltay, born 1883; H. S. Kızıldoğan, born 1884; H. Z. Koşay, born 1897; A. Ogan, born 1888; Y. Z. Özer, born 1870; İ. Sungu, born 1883; O. Ş. Uludağ, born 1889; İ. H. Uzunçarşılı, born 1888 and H.-Â. Yücel, born 1897. 13 Ö. L. Barkan, born 1902; U. İğdemir, born 1901; Â. İnan, born 1908; B. H. Nedkoff, born 1910; F. Öymen, born 1900; T. Özgüç, born 1916; and F. A. Tansel, born 1912. Notably, all female authors belong to the younger generation and were thus more likely to profit from the growing opportunities provided by late Ottoman as well as Republican educational reforms. 14 I include not only full research articles but also pieces such as congress reports, speeches, review articles, and news items. 15 These samples intersect: We can find articles that mention all three periods and hence appear in all three figures. Furthermore, it should be noted that the articles do not necessarily use the terms “Tanzimat Era” and “Hamidian Era”. These are merely blanket terms I use in order to identify whether or not a certain article deals with a specific timeframe. 16 Not all obituaries have been included in this sample, simply because not all of them mention the post-1908 Ottoman Empire. A few are only concerned with the Republican era, others narrate events from the Hamidian era, but omit the Second Constitutional Era. 17 These labels are not mutually exclusive. Several articles figure in more than one category. An overlap between “Atatürk’s biography”, “War of Independence” and “First World War” is maybe most obvious. 18 Hikmet Bayur (1891-1980) was the descendant of a politically influential Ottoman personality. His grandfather was Kıbrıslı Mehmed Kâmil Paşa, who had served as grand vizier four times between 1885 and 1913, under both Abdülhamid II and his successor Mehmed V Reşad (cf. Turan 2014: 246). While this may partly account for Bayur’s specific interest in the late Ottoman period, it would be too limiting to read his scholarly output merely as determined by his family heritage. 19 These are original publications and should not be confused with the interview series with Mustafa Kemal on his recollections from the Young Turk period, published in Milliyet in the spring of 1926; comp. Zürcher (1984: 25–26). 20 For a discussion of the degree to which the Türk Tarih Tezi was accepted in wider historiographical circles, see Ersanlı (2002b: 116). 23 Original: “Vaziyeti kurtarmak için hüsnü niyetle çalışıldı; birçok gayretler sarfolundu, fakat bu da kâfi gelmedi”. 25 Original: “Onlarca Türk zelil bir hayat sürmeğe mahkûmdur, onun büyük, hattâ müstakil bir millet gibi hakkını istemesi, menfaatlerini koruması, kendini saydırmağa kalkışması, herkesten müsavat dairesinde muamele görmekte ısrar etmesi, havsalanın alamıyacağı bir cür’ettir”. 39 The rhetoric of decline runs through much of early Republican (state) historiography, but it also finds its repercussions within European Turkology. For a concise discussion of the evolution of this decline paradigm, see Quataert (2003: 1–4); for an appraisal of the paradigm’s career in Republican Turkey, see Ersanlı (2002b: 137); and for an analysis of more recent scholarly debates on the decline and transformation paradigms, see Bouquet (2016). 46 Bayur’s article analyses a memorandum by Foreign Minister Ahmed İzzet Paşa, presented to Grand Vizier Tevfik Paşa in January 1922. 47 Original: “Bu lâyiha 40 yaşını geçmiş olanlara çocukluk ve gençliklerinin nasıl bir muhitte geçmiş olduğunu hatırlatır, 35 yaşından aşağı olanlara da hem pek uzak, hem pek yakın olan bir geçmişte baba ve ağabeylerinin yaşamış oldukları muhitte hâkim olan siyasî ruhu öğretir”. 48 My thanks to Raoul Motika and Christoph K. Neumann for the comments and discussion that brought about this analysis. 49 The Amasya Protocols were signed between the Istanbul government and the Heyet-i Temsiliye, a predecessor’s organization of the Türkiye Büyük Millet Meclisi, on 22 October 1919. They thus bring together in a common sphere actors that would later on be framed as “Ottoman” and “Republican” respectively. Comp. Zürcher (1984: 103). 50 The analysis conducted within this paper is part of an ongoing larger doctoral research project that aims at investigating, on a broad source base (not limited to state historiography), how the post-1908 Ottoman Empire was represented in scholarly history-writing in Republican Turkey from the 1930s to the mid-1950s.